Earlier this week Sean Colfer considered the men’s, women’s and mixed teams worth looking out for at the upcoming ECBU in Portimao, Portugal. This year’s tournament is particularly exciting as the Great Grand Masters division is debuting at the European games. With this new category, there will be 46 teams competing over five master’s divisions to become beach ultimate champions. Although many of the official teams are yet to be released, I will be making predictions about which countries are likely to dominate the field. After coming second to Great Britain at ECBU 2013, the French managed to step up their game on the world stage at WCBU 2017. Finessing games on Royan’s beaches in France, they made the final, losing in style (13-7), to the USA. This was a great result considering the USA’s dominance throughout the week. Reviewing France’s successes since worlds, the French team Angers came sixth in European Ultimate Club Championships in 2018. The French were also well represented at the WFDF World Masters Ultimate Club Championships in the same year. Sun Creteil came seventh amongst a host of strong American and Canadian teams. Provided they bring this level of talent to the games, France are sure to generate a storm. Germany’s mixed masters team consistently bring a tough, sleek game to the pitch. They won the mixed masters division in 2013, beating GB 11-10 in the finals, and narrowly missed out on a bronze medal to France in Royan. At Sabe a Mixta, a warmup tournament held in Spain, Germany brought their national team under the name of Meehr and were the second-highest ranking masters team following Spain. The German and Spanish teams came fifth and seventh, respectively, at the tournament. The Spaniards’ result is a little surprising as Spain’s masters teams haven’t historically topped beach ultimate ranking tables. However, they may be the dark horse of this division, turning heads in Portimao. Sweden’s women are another team that could take viewers by surprise at ECBU. Sweden unfortunately didn’t manage to take a women’s team to the 2013 championships in Spain. Despite this, they managed a fifth place finish at the world championships in Royan. It will be fascinating to witness how the team has changed since Worlds, to see the improvements made amongst a team who are relatively new to beach ultimate. Taking home a bronze medal in 2013 (EBUC) and a silver in 2017 (WCBU), it seems the only way is up for Great Britain’s Grandmasters. Although there is little crossover between the team taken to the World Championships and the team GB intends to take to Portugal (it seems GB’s Great Grandmasters Division has stolen a few players), this shouldn’t alter expectations. With players such as Dave Bixler and Si Weeks who have previously played for successful GB’s masters teams as well as renowned clubs like Clapham and Chevron, there’ll be no doubt that GB will bring steep competition. As a new division with little history, it’s difficult to make strong predictions regarding the results of the Great Grand Masters division. 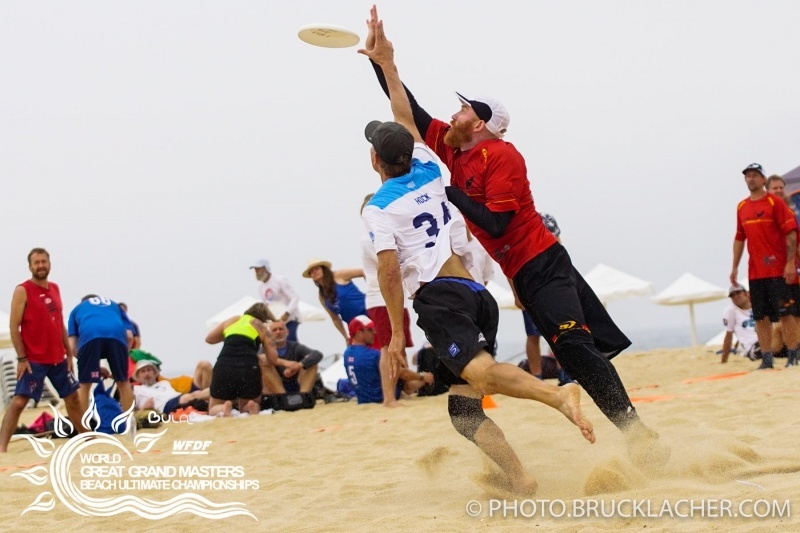 However, at the 2017 World Great Grandmasters Beach Ultimate Championships in Lisbon, the highest-ranking European teams were Austria, Germany and Currier Island No Borders. Perhaps we can expect a similar outcome at EBUC. Whilst these predictions are up for debate, some things are certain: the European Championships will be an electric event with top athletes from all over Europe fighting for their teams to succeed – even those athletes with a bit more seasoning than in some other divisions. Stay tuned for more news as we approach the European Championships in May.